Glass garage doors with aluminum frames have been popping up in new construction of restaurants all across the country in the past few years and it's obvious why. These doors are perfect for providing customers the outdoor dining experience at a moments notice. They are also great for keeping patio and bar areas secure while giving restaurant owners the ability to utilize patio seating in seasons with colder temperatures. Most newly built restaurant have glass overhead doors incorporated into the initial design on the building but you also see a lot of older restaurants removing windows to incorporate the instant open design that a glass door provides. 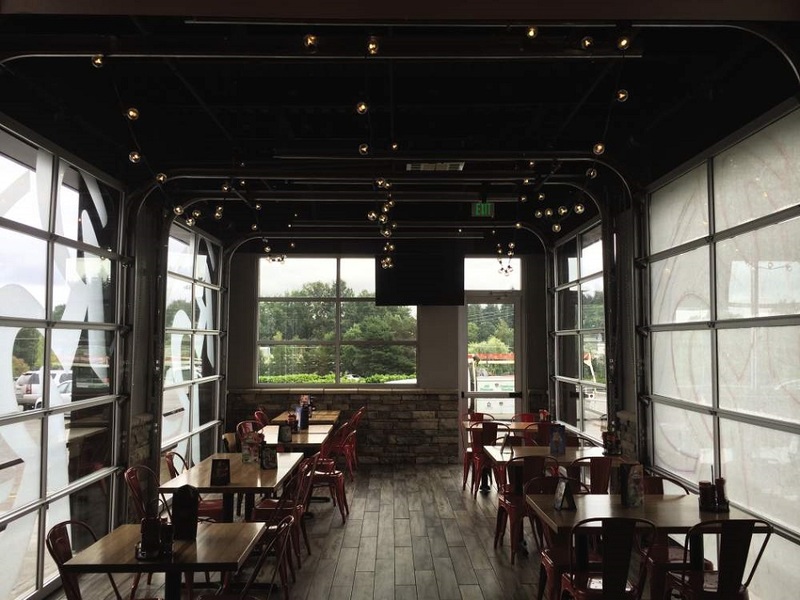 Here's some of our favorite uses of glass garage doors on restaurants. 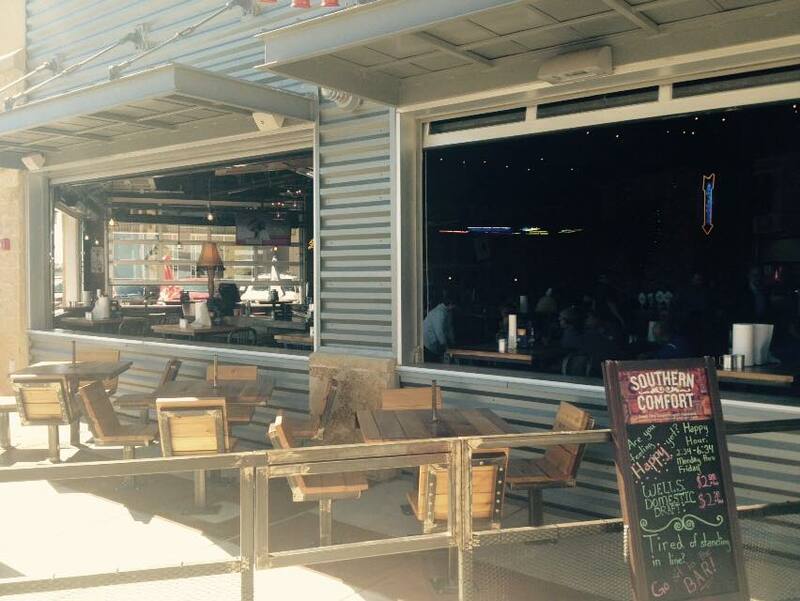 We love how Twisted Root Burger Company uses these glass aluminum Model 521 garage doors for their patio. Many restaurants use these doors to open the inside to the outdoors. These are unique as they are installed on a half-wall, replacing the need for windows. 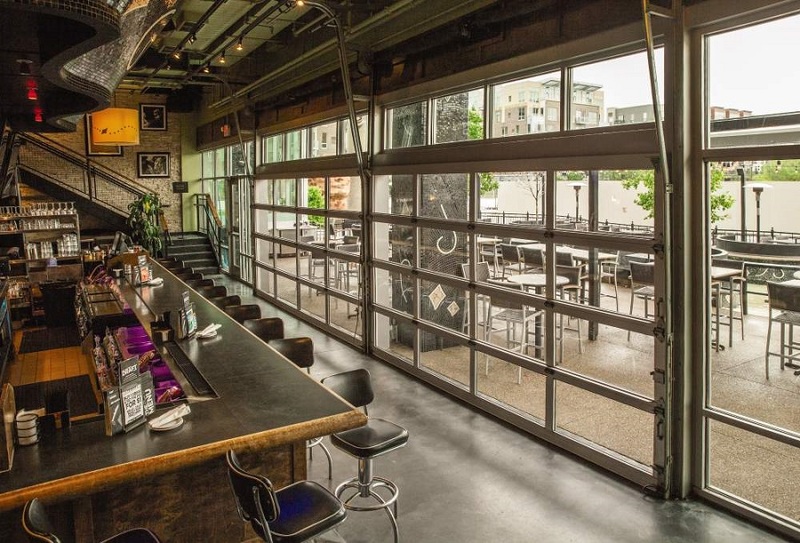 We see our glass aluminum garage doors used for bars a lot. This keeps the restaurant and bar secure while closed but also gives restaurants the option to close off the outside when the weather isn’t ideal for customers to enjoy a drink outside on the patio. 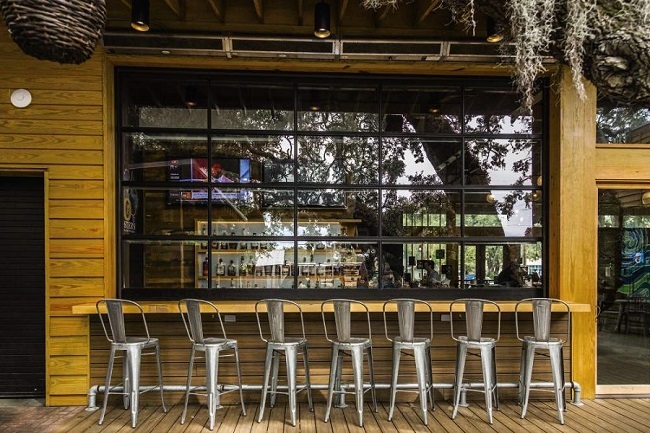 These are some of my favorite applications for glass aluminum garage doors because they really open-up the restaurant space. The great thing about using glass is that whether the doors are closed or open they instantly give the restaurant a more open feel, especially when the door goes all the way to the ground giving customer a full wall of glass to view the outdoor patio. This restaurant uses glass doors on this patio area. It’s a wing on the restaurant that allows more seating in all four seasons. 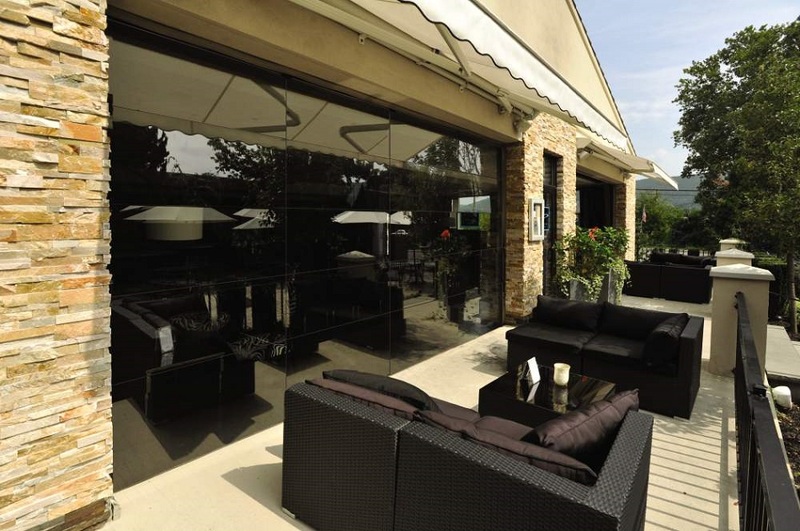 This patio area uses four doors which when opened, really gives the outdoor patio experience to customers. You can see how the installers made the tracks of the doors on the right side longer, so they would roll-up over the doors on the left side. 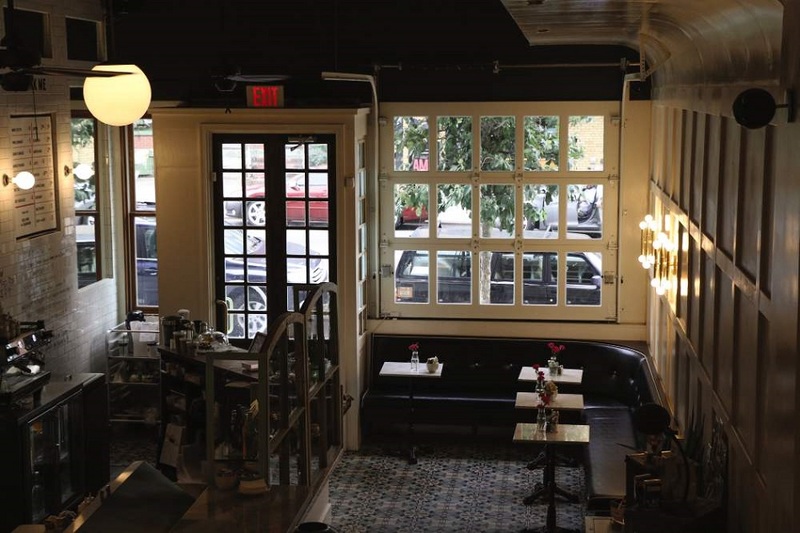 This is a bistro along a city street that took out a large window in the front and replaced it with a roll-up glass aluminum door. This really opens the space to the street, typically seen on many European cafes and bistros. Overhead Door’s newest addition to the glass door line-up is the Envy. This is the Envy Model 522 which features a frame-less design that is perfect for upscale restaurants that are looking for an ultra-sleek, modern design.